C&F Design 401Tube Fly Case 4 compartments in base will hold tubes up to 3” long. 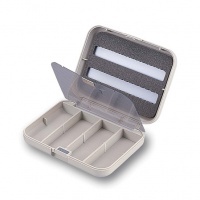 Magnetic closure lift-up clear fly lid over compartments. Two pocket slit foam in lid will hold trebles securely. Clip holder for C&F Nail Knot Pipe ( not included ).